On May 17, 1968, nine Catholic activists, including two priests, staged a potent bit of political theater outside a Knights of Columbus Hall in Catonsville, Maryland. Using homemade napalm concocted from gasoline and soap, they burned 378 draft files they had taken from a small office the Selective Service had leased in that building—documents that presumably would have sent that number of young American men to fight in the increasingly unpopular war in Vietnam. On May 17, 1968, nine Catholic activists, including two priests, staged a potent bit of political theater outside a Knights of Columbus Hall in Catonsville, Md. A few years later, after a trial had found all nine guilty and most had served a few years in prison (Mary Moylan remained on the run until 1978), Berrigan turned the ordeal into a play, “The Trial of the Catonsville Nine,” staged first in Los Angeles and later turned into a film. A stirring, often poetic piece of protest art, it is being brought to vivid new life in an Off-Broadway revival by the New York City company the Transport Group. Where previous productions staged it as a more or less straightforward courtroom drama, the director Jack Cummings III has reimagined it as a kind of found text, recited and enacted by three Asian American actors. As Mia Katigbak, Eunice Wong, and David Huynh wander onto the stage of the Abrons Arts Center, where the audience has been seated in the round, they seem to discover the court transcripts on a set of desks amid other detritus of the late 1960s: a vinyl record player, countless Life magazine covers and news clippings, and file folders like the ones the activists incinerated half a century ago. It is a fascinating way to stage this time capsule of an age ever more polarized than our own, holding it at a remove that often makes its contemporary resonances—about abuse of power, government transparency and the necessity of resistance—ring all the louder. Remarkably, the play and its arguments remain easy to follow, even as these three actors shift among multiple roles from scene to scene, and in one case from sentence to sentence. 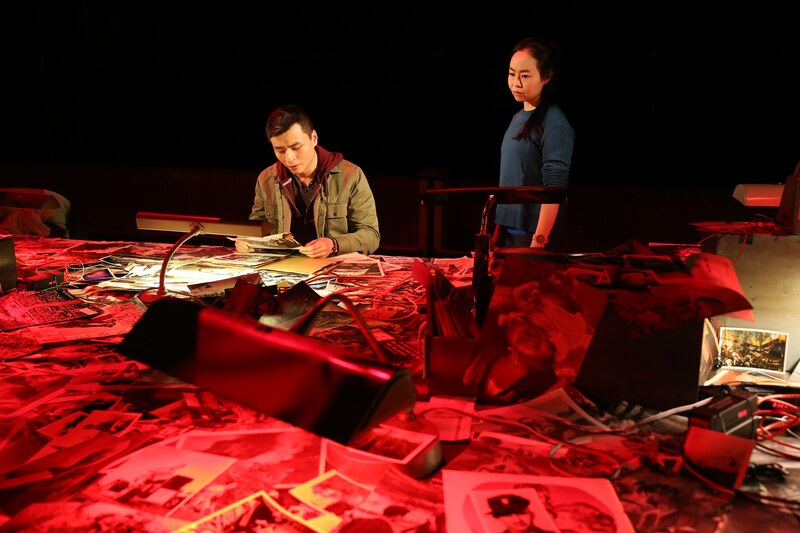 Less easy to parse is the way the presence of Asian American actors reframes the play’s central strategy, which is to place U.S. involvement in Vietnam in context as one in a series of American crimes, both foreign and domestic. Several of the Catonsville activists recount a process of radicalization: After witnessing U.S.-sponsored executions in Guatemala, American incursions into the Congo or the killing of unarmed black men in U.S. cities, they are primed to see our involvement in Vietnam as part of a pattern and ready to take drastic action to stop it. “We are not trying that case,” they are repeatedly told by government prosecutors when they try to introduce other chapters in the larger story of U.S. perfidy. But there was no single Vietnam war. For the Vietnamese, Laotians and Cambodians, it was one in a series of conflagrations in which the West, China and the Soviet Union all played key roles, but which also had their own internal dynamics and complicated histories. Was it a brutal proxy war between Cold War adversaries, a genuine people’s revolution or a civil war among rival parties? It was arguably all these things, and the principled anti-war stance would be to oppose conflict in all its manifestations, not choose sides. That is what Berrigan seems to do in a key passage of “Catonsville Nine,” when he describes a trip to Hanoi, in North Vietnam, to witness the devastation wrought by U.S. bombs. In Cummings’ staging, this moment is followed by Huynh quoting, in Vietnamese, words from the U.S. Declaration of Independence—ones used in a famous speech by North Vietnamese leader Ho Chi Minh. I can’t tell if Cummings means for us to feel the painful irony of having Huynh, the child of South Vietnamese refugees who fought and fled Ho’s forces, deliver this speech, apparently approvingly. But it certainly complicated my experience of the play. The times are inexpressibly evil. And yet—and yet…the times are inexhaustibly good. In this time of death, some men and women, the resisters, work hardily for social change. We think of such people in the world and the stone in our breast is dissolved. Part of the joy of doing analytic philosophy was seeing if the argument would work and really testing it and having a group of people around a table giving it all sorts of logical critiques. And then others would try to defend it. And that is how I thought about the academic project. But now that I am actually in the academy I see first-hand how little that approach is actually used. Geometry Dash is a series of five video games developed by Sweden-based developer Robert Topala, and published by his company, RobTop Games. The principal game, Geometry Dash, it is a rhythm-based platforming game which currently has 21 official levels and has more than 40 million online levels made by players. Rob Weinert-Kendt, an arts journalist and editor of American Theatre magazine, has written for The New York Times and Time Out New York.